In a previous post, I pointed out that state and local governments in the US have large asset positions — 33 percent of GDP in total, down from nearly 40 percent before the recession. This is close to double state and local debt, which totals 17 percent of GDP. Among other things, this means that a discussion of public balance sheets that looks only at debt is missing at least half the picture. On the other hand, a bit over half of those assets are in pension funds. Some people would argue that it’s misleading to attribute those holdings to the sponsoring governments, or that if you do you should also include the present value of future pension benefits as a liability. I’m not sure; I think there are interesting questions here. But there are also interesting questions that don’t depend on how you treat the existing stocks of pension assets and liabilities. Here are a couple. First, how how do changes in state credit-market debt break down between the current fiscal balance and other factors, including pension fund contributions? And second, how much of state and local fiscal imbalances are financed by borrowing, and how much by changes in the asset position? Think about it: what is a regression doing? Basically, we have a variable a that we think is influenced by some others: b, c, d … Our observations of whatever social process we’re interested in consist of sets of values for a, b, c, d… , all of them different each time. A regression, fundamentally, is an imaginary experiment where we adjusted the value of just one of b, c, d… and observed how a changed as a result. That’s the meaning of the coefficients that are the main outputs of a regression, along with some measure of our confidence in them. But in the case of state budgets we already know the coefficients! If you increase state spending by one dollar, holding all other variables constant, well then, you increase state debt by one dollar. If you increase revenue by one dollar, again holding everything else constant, you reduce debt by one dollar. Budgets are governed by accounting identities, which means we know all the coefficients — they are one or negative one as the case may be. What we are interested in is not the coefficients in a hypothetical “data generating process” that produces changes in state debt (or whatever). What we’re interested in is how much of the observed historical variation in the variable of interest is explained by the variation in each of the other variables. I’m always puzzled when I see people regressing the change in debt on expenditure and reporting a coefficient — what did they think they were going to find? So for example: If the budget balance is defined as revenue – spending, then the variance of some observed budget balances must be equal to the covariance of the balance with revenue, minus the covariance of the balance with spending. This makes a covariance matrix an obvious tool to use when we want to allocate the observed variation in a variable among various known causes. But for whatever reason, economists turn to variance decompositions only in few specific contexts. It’s common, for instance, to see a variance decomposition of this kind used to distinguish between-group from within-group inequality in a discussion of income distribution. But the same approach can be used any time we have a set of variables linked by accounting identities (or other known relationships) and we want to assess their relative importance in explaining some concrete variation. revenues + borrowing = expenditure + net acquisition of financial assets (NAFA). This is also an accounting identity, but not an exact one; it’s a linear approximation of the true relationship, which is nonlinear. But with annual debt and income growth rates in the single digits, the approximation is very close. How do we read this? First of all, note the bolded terms along the main diagonal — those are the covariance of each variable with itself, that is, its variance. It is a measure of how much individual observations of this variable differ from each other. The off-diagonal terms, then, show how much of this variation is shared between two variables. Again, we know that if one variable is the sum of several others, then its variance will be the sum of its covariances with each of the others. So for example, total variance of debt ratio growth is 0.18. (That means that the debt ratio growth in a given year is, on average, about 0.4 percentage points above or below the average growth rate for the full period.) The covariance of debt-ratio growth and (negative) growth contribution is 0.10. So a bit over half the debt-ratio variance is attributable to nominal GDP growth. In other words, if we are looking at why the debt-GDP ratio rises more in some years than in others, more of the variation is going to be explained by the denominator of the ratio than the numerator. Next, we see that the covariance of debt growth with the (negative) fiscal balance is 0.03. In other words, about one-sixth of the variation in annual debt ratio growth is explained by fiscal deficits or surpluses. This is important, because most discussions of state and local debt implicitly assume that all change in the debt ratio is explained this way. But in fact, while the fiscal balance does play some role in changes in the debt ratio — the covariance is greater than zero — it’s a distinctly secondary role. Finally, the last variable, “NAFA & Trusts,” explains about a third of variation in debt ratio growth. In other words, years when state and local government debt is rising more rapidly relative to GDP, are also years in which those governments are adding more rapidly to their holdings of financial assets. And this source of variation explains about twice as much of the historical pattern of debt ratio changes, as the fiscal balance does. Since this is probably still a bit confusing, the next table presents the same information in a hopefully clearer way. Here see only the covariances with debt ratio growth — the first column of the previous table — and they are normalized by the variance of debt ratio growth. Again, I’ve flipped the sign of variables that reduce debt-ratio growth. So each value of the table shows the share of variation in the growth of state-local growth ratios that is explained by that component. There is also a second column, showing the same thing for state governments only. So now we have shown more rigorously what we suggested in the previous post: While the fiscal balance plays some role in explaining why state and local debt ratios rise at some times and fall at others, it is not the main factor. Nominal growth rates and asset acquisition both play larger roles. Let’s turn to the next question: How do state and local government balance sheets adjust to fiscal imbalances? Again, this is just a re-presentation of the data in the first table, this time focusing on the third column/row. Again, we’re also doing the decomposition for states in isolation, and adding a couple more items — in this case, the taxes and intergovernmental assistance components of revenue, and the pension contribution component of NAFA. The values are normalized here by the variance of the fiscal balance. The first four lines sum to 1, as do the last three. In effect, the first four rows of the table tells us where fiscal imbalances come from; the final three tell us where they go. So what do we see? Looking at the first set of lines, we see that state-local fiscal imbalances are entirely expenditure-driven. Surprisingly, revenues are no lower in deficit years than in surplus ones. Note that this is true of total revenues, but not of taxes. Deficit years are indeed associated with lower tax revenue and surplus years with higher taxes, as we would expect. (That’s what the positive values in the “taxes” row mean.) But this is fully offset by the opposite variation in payments from the federal government, which are lower in surplus years and higher in deficit years. During the most recent recession, for example, aggregate state and local taxes declined by about 0.4 percent of GDP. But federal assistance to state and local governments increased by 0.9 percent of GDP. This was unexpected to me: I had expected most of the variation in state budget balances to come from the revenue side. But evidently it doesn’t. The covariance matrix is confirming, and quantifying, what you can see in the figure below: Deficit years for the state-local sector are associated with peaks in spending, not troughs in revenue. Turning to the question of how imbalances are accommodated, we find a similarly one-sided story. None of the changes in state-local budget balances result in changes in borrowing; all of them go to changes in fund contributions and direct asset purchases. For the sector as a whole, in fact, asset purchases absorb more than all the variation in fiscal imbalances; borrowing is lower in deficit years than in surplus years. (For state governments, borrowing does absorb about ten percent of variation in the fiscal balance.) Note that very little of this is accounted for by pensions — less than none in the case of state governments, which see lower overall asset accumulation but higher pension fund contributions in deficit years. Again, even though pension funds account for most state-local assets, they account for very little of the year to year variation in asset purchases. So the data tells a very clear story: Variation in state-local budget balances is driven entirely by the expenditure side; cyclical changes in their own revenue are entirely offset by changes in federal aid. And state budget imbalances are accommodated entirely by changes in the rate at which governments buy or sell assets. Over the postwar period, the state-local government sector has not used borrowing to smooth over imbalances between revenue and spending. The interesting historical meta-question, to which I have no idea of the answer, when and why regression analysis came to so completely dominate empirical work in economics. I suspect there are some deep reasons why economists are more attracted to methodologies that treat observed data as a sample or “draw” from a universal set of rules, rather than methodologies that focus on the observed data as the object of inquiry in itself. I confess I only realized recently that variance decompositions can be used this way. In retrospect, we should have done this in our papers in household debt. Revenue and expenditure here include everything except trust fund income and payments. In other words, unlike in the previous post, I am following the standard practice of treating state and local budgets separate from pension funds and other trust funds. The last line, “NAFA and Trusts”, includes both contributions to trust funds and acquisition of financial assets by the local government itself. But income generated by trust fund assets, and employee contributions to pension funds, are not included in revenue, and benefits paid are not included in expenditure. So the “fiscal balance” term here is basically the same as that reported by the NIPAs and other standard sources. This is different from households and the federal government, where higher debt and, in the case of households, more variable interest rates, mean that interest rates are of first-order importance in explaining the evolution of debt ratios over time. It might seem contradictory to say that a third of the variation in changes in the debt ratio is due to the fiscal balance, even though none of the variation in the fiscal balance is passed through to changes in borrowing. The reason this is possible is that those periods when there are both deficits and higher borrowing, also are periods of slower nominal income growth. This implies additional variance in debt growth, which is attributed to both growth and the fiscal balance. There’s some helpful discussion here. Are US Households Done Deleveraging? This Tuesday, I’ll be at Joseph Stiglitz’s event at Columbia University on finance and inequality, presenting my work with Arjun Jayadev on household debt. You can find the latest version of our paper here. In preparation, I’ve been updating the numbers and the results are interesting. As folks at the Fed have noted, the post-2007 period of household deleveraging seems to have reached its end. Here’s what the household debt picture looks like, in the accounting framework that Arjun and I prefer. The units are percent of adjusted household income. (We can ignore the adjustments here.) The heavy black line shows the year-over-year change in household debt-income ratios. The bars then disaggregate that change into new borrowing by households — the primary deficit — and the respective contributions of interest payments, inflation, income growth, and defaults. A negative bar indicates a factor that reduces leverage; in most years, this includes both (real) income and inflation, since by raising the denominator they reduce the debt-income ratio. A positive bar indicates a factor that increases leverage; this includes interest payments (which are always positive), and the primary deficit in years in which households are on net receiving funds from credit markets. In 2006 and 2007, debt-income ratios rose by about 3 percent each year; this is well below the six-point annual increases earlier in the 2000s, but still substantial. In 2008, the first year of the recession, the household debt-income ratio rises by another 3 points, despite the fact that households are now paying down debt, with repayments exceeding new borrowing by nearly 8 percent of household income. This is an astonishing rate of net repayment, the greatest since at least 1931. But despite this desperate effort to deleveraging, household debt-income ratios actually rose in 2008, thanks to the sharp fall in income and to near-zero inflation — in most years, the rise in prices automatically erodes the debt-income ratio. The combination of negative net borrowing and a rising debt burden is eerily reminiscent of the early Depression — it’s a clear sign of how, absent Big Government, the US at the start of the last recession was on track for a reprise of the Depression. Interest payments make a stable positive contribution to the debt-incoem ratio throughout this period. Debt-service payments do fall somewhat, from around 7 percent of household income in 2006 to around 5 percent in 2013. But compared with other variables important to debt dynamics, debt-service payments are quite stable in the short-term. (Over longer periods, changes in effective interest rates are a ] bigger deal.) It’s worth noting in particular that the dramatic reduction in the federal funds rate in 2007-2008 had a negligible effect on the average interest rate paid by households. This much is in the paper. But in 2013 the story changes a bit. The household debt-income ratio rises again, for the first time since 2008. And the household balance movers into deficit, for the first time since 2007 — for the first time in six years, households are receiving more funds from the credit markets than they are paying back to them. These events are linked. While the central point of our paper is that changes in leverage cannot be reduced to changes in borrowing, for the US households in 2013, it is in fact increased borrowing that drove the rise in debt-income ratios. Inflation and income growth were basically constant between 2012 and 2013. The 5-point acceleration in the growth of the household debt-income ratio is explained by a 4.5 point rise in new borrowing by households (plus a 1.5 point fall in defaults, offset by a 1-point acceleration in real income growth). So what do we make of this? Well, first, boringly perhaps but importantly, it’s important to acknowledge that sometimes the familiar story is the correct story. If households owe more today than a year ago, it’s because they borrowed more over the past year. It’s profoundly misleading to suppose this is always the case. But in this case it is the case. Secondly, I think this vindicates the conclusion of our paper, that sustained deleveraging is impossible in the absence of substantially higher inflation, higher defaults, or lower interest rates. These are not likely to be seen without deliberate, imaginative policy to increase inflation, directly reduce the interest rates facing households, and/or write off much more of household debt than will happen through the existing bankruptcy process. Otherwise, in today’s low-inflation environment, as soon as the acute crisis period ends leverage is likely to resume its rise. Which seems to be what we are seeing. [*] More precisely: By our calculations, defaults reduced the aggregate household debt-income ratio by 20 points over 2008-2012, out of a total reduction of 21.5 points. Posted on November 30, 2014 May 14, 2015 Tags accounting decompositions, debt, defaults, fiscal arithmetic, Fisher dynamics, interest rates5 Comments on Are US Households Done Deleveraging? One interesting issue in the ongoing secular stagnation debate is the relationship between debt and aggregate demand. In particular, there’s been a revival of the claim that there is something like a one to one relationship between changes in the ratio of debt to income, and final demand for goods and services. I would like to reframe this claim a bit, drawing on my recent work with Arjun Jayadev. In a nutshell: Changes in debt-income ratios reflect a number of macroeconomic variables, and until you have a specific story about which of those variables is driving the debt-income ratio, you can’t say what relationship to expect between that ratio and demand. We show in our paper that the entire post-1980 rise in household debt ratios can be explained, in an accounting sense, by higher real interest rates. Conversely, if the interest rates faced by households are lower in the future, debt-income ratios will decline without any fall in demand for real goods and services. For most of these writers, the important point was that the effect of debt on demand is two-faced: new borrowing can finance additional expenditure on real goods and services, but on the other hand debt service payments (in the presence of credit constraints) subtract from the funds available for current expenditure. Eichner, for instance, uses the equation E = F + delta-D – DS, or aggregate expenditure equals cashflow plus debt growth minus debt service payments. More generally, to think systematically about the relationship between debt and household expenditure, we need to start from a consistent set of accounts. The first principle of financial accounting is that, for any economic unit, total sources of funds must equal total uses of funds. There are many ways of organizing accounts, at the level of the individual household or firm, at the level of the sector, or at the level of the nation, but this equality must always hold. You can slice up sources and uses of funds however you like, but total money coming in must equal total money going out. The standard financial accounts for the United States are the Flow of Funds, maintained by the Federal Reserve. A number of alternative accounting frameworks are reflected in the social accounting matrixes developed by the late Wynne Godley and Lance Taylor and their students and collaborators. The items before the equal sign are sources of funds; the items after are uses. The first two uses of funds are included in GDP measured as income, while the latter two are not. Similarly, the first two uses of funds are included in GDP measured as expenditure, while the latter three are not. When we look at the whole balance sheet, it is clear that borrowing cannot change in isolation. An increase in one source of funds must be accompanied by some mix of increase in some use(s) of funds, and decrease in other sources of funds. So if we want to talk about the relationship between borrowing and GDP, we need a story about what other items on the balance sheet are changing along with it. One possible story is that changes in borrowing are normally matched by changes in consumption, or in residential investment. This is the implicit story behind the suggestion that lower household borrowing will reduce final demand dollar for dollar. But there is no reason in principle why that has to be the main margin that household borrowing adjusts on, and as we’ll see, historically it often has not been. So far we have been talking about the absolute levels of borrowing and other flows. But in general, we are not interested in the absolute level of borrowing, but on the ratio of debt to income. It’s common to speak about changes in borrowing and changes in debt-income ratios as if they were synonyms. But they are not. The debt-income ratio has a denominator as well as a numerator. The denominator is nominal income, so the evolution of the ratio depends not only on household borrowing, but on real income growth and inflation. Faster growth of nominal income — whether due to real income growth or inflation — reduces the debt-income ratio, just as much as lower borrowing does. In short: For changes in the debt-income ratio to be reflected one for one in aggregate demand, two things must be true. First, changes in the ratio must be due mainly to variation in the numerator, rather than the denominator. And second, changes in the numerator must be due mainly to variation in consumption and residential investment, rather than variation in other balance sheet items. How true are these things with respect to the rise in debt-income ratios over the past 30 years? To frame the question in a tractable way, we need to simplify the balance sheet, combining some items to focus on the ones we care about. In our paper, Arjun and I were interested in debt ratios, not aggregate demand, so we grouped together all the non-credit flows into a single variable, which we called the household primary deficit. We defined this as all uses of funds except interest payments, minus all sources of funds except borrowing. Here, I do things slightly differently. I divide changes in debt into those due to nominal income growth, those due to expenditures that contribute to aggregate demand (consumption and residential investment), and those due to non-demand expenditure (interest payments and net acquisition of financial assets.) For 1985 and later years, I also include the change in debt-income ratios attributable to default. (We were unable to find good data on household level defaults for earlier years, but there is good reason to think that household defaults did not occur at a macroeconomically significant level between the Depression and the Great Recession.) This lets us answer the question directly: historically, how closely have changes in household debt-income ratios been linked to changes in aggregate demand? Figure 1 shows the trajectory of household debt for the US since 1929, along with federal debt and non financial business debt. (All are given as fractions of GDP.) As we can see, there have been three distinct episodes of rising household debt ratios since World War II: one in the decade or so immediately following the war, one in the mid-1980s, and one in the first half of the 2000s. It’s clear from this figure that there is an important element of truth to the Keen-Krugman view that there is a tight link between the debt-incoem ratio and demand. There is evidently a close relationship between household demand and changes in the debt ratio, especially with respect to short-term variation. But that view is also missing something important. In some periods, there are substantial divergences between final demand from household and changes in the debt ratio. In particular, the increase in the household debt ratio in the 1980s (by about 20 points of GDP) took place during a period when consumption and residential investment by households were near their lowest levels since World War II. The increase in household debt after 1980 has often been described as some kind of “consumption binge”; this is the opposite of the truth. The ambiguous relationship between household debt and aggregate demand can be seen in Table 1, which compares the periods of rising household debt with the intervening periods of stable or falling debt. The numbers are annual averages; to facilitate comparisons between periods, the averages for sub periods are again expressed as deviations from the 1950-2010 mean. (Or from the 1985-2010 mean, in the case of defaults.) The numbers are the contributions to the change i the debt-income ratio, so a positive value for nominal income growth indicates lower inflation and/or growth than the postwar average. What we see here is that while the first and third episodes of rising debt are indeed associated with higher than average household expenditure on real goods and services, the 1980s episode is not. 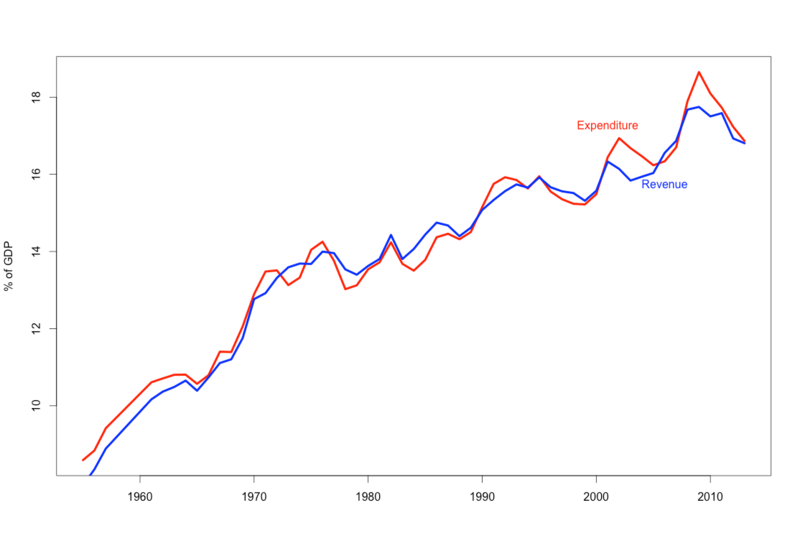 The rise in debt in the 1980s is explained by a rise in non-demand expenditures. Specifically, it is entirely due to the rise in interest payments, which doubled from 3-4 percent of household income in the 1950s and 1960s to over 8 percent in the late 1980s. (Interest payments continued around this level up to the Great Recession, falling somewhat only in the past few years. The reason “non-demand expenditures” is lower after 1990 is because the household sector sharply reduced net acquisition of financial assets.) 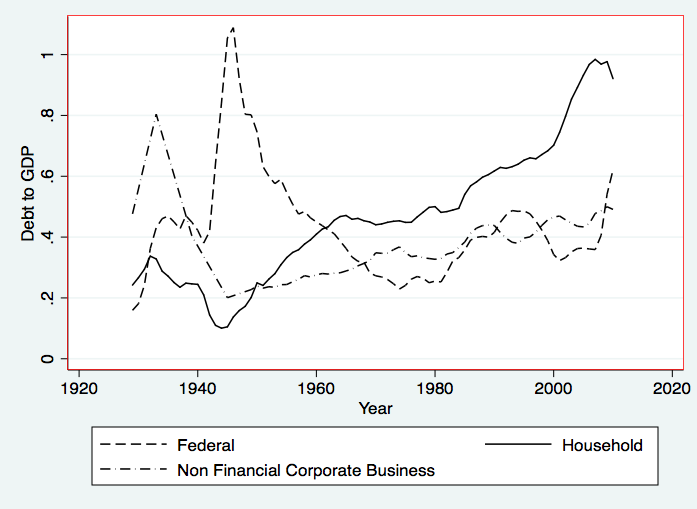 Also, note that while the housing booms of 1949-1963 and 1999-2006 saw almost identical levels of household expenditure on real goods and services, the household debt ratio rose nearly twice as fast in the more recent episode. The reason, again, is because of much higher interest payments in the 2000s compared with the immediate postwar period. Finally, as I’ve pointed out on this blog before, the deleveraging since 2008 would have been impossible without elevated household defaults, which approached 4 percent of outstanding household debt in 2009-2010 — partly offset by the sharp fall in household income in 2009, which raised the debt-income ratio. Figure 3, from our paper, offers another way of looking at this. The heavy black line is the actual trajectory of the household debt-income ratio. 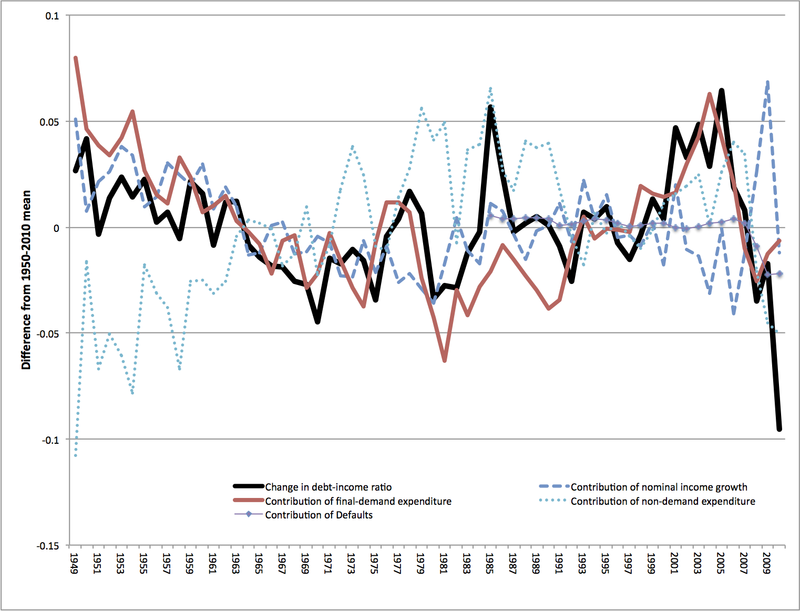 The other lines show counterfactual scenarios in which non-interest household expenditures are at their historical levels, but growth, inflation and/or interest rates are held constant at their 1946-1980 average levels. All these counterfactual scenarios show a spike in the 2000s: People really did borrow to pay for new houses! But the counterfactual scenarios also show lower overall trends of household debt, indicating that slower income growth, lower inflation and higher interest rates all contributed to the rise of household debt post-1980, independent of changes in borrowing behavior. 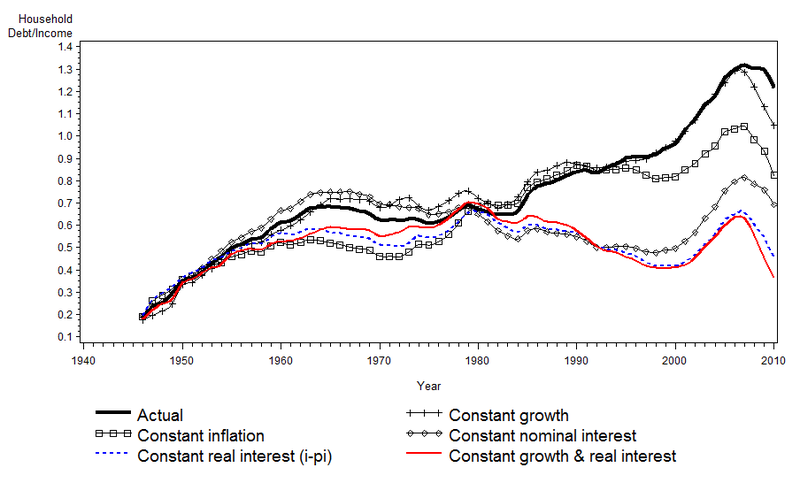 Most interestingly, the red line shows that new borrowing after 1980 was lower than new borrowing in the 1950s, 60s and 70s; if households had engaged in the exact same spending on consumption, residential investment and financial assets as they actually did, but inflation, growth and interest rates had remained at their pre-1980 levels, the household debt-income ratio would have trended gradually downward. To the extent that rising debt-income ratios after 1980 were the result of higher interest rates and disinflation, they were not contributing to aggregate demand. And if lower interest rates and and, perhaps, higher inflation and/or higher default rates bring down debt ratios in the future, deleveraging will not be a headwind for demand. It is customary to see rising debt as the result of private choices to finance higher expenditures by issuing new credit-market liabilities. But historically, it is equally correct to see rising debt as the result of political choices that increase the real value of existing liabilities. I’m pleased to report that a version of this paper has been accepted for publication by American Economic Journal: Macroeconomics. This has caused some adjustment in my view of the permeability of the “mainstream-heterodox” divide. This neglect of the earlier literature is especially puzzling since several of the protagonists of the 1990-era discussion are active in the sequel today. Steve Fazzari, for instance, in his several superb recent papers (with Barry Cynamon) on household debt, does not refer to his own 1991 paper, tho it is dealing with substantially the same questions. Only a few minor items are left out. This grouping of sources and uses of funds essentially follows Lance Taylor’s social accounting matrices, as presented in Reconstructing Macroeconomics and elsewhere. Neither the NIPAs nor the Flow of Funds present household accounts in exactly this way. The Flow of Funds groups all three sources of household income together, treats consumer durables as a separate category of household investment, and treats interest payments as consumption. The NIPAs treat residential investment and mortgage interest payments as their own sector, separate from the household sector, and omits borrowing and net acquisition of financial assets. The NIPAs also include a number of noncash items, of which the most important is the imputed flow of housing services from the owner-occupied housing sector to the household sector and the corresponding imputed rental payments from the household sector to the owner-occupied residential sector. For example, a recent paper on the causes of “The Rise in U.S. Household Indebtedness” begins with the sentence, “During the past several decades in the United States, signi ficant changes have occurred in household saving and borrowing behavior,” with no sign of realizing that this is a different question than the one posed by the title. A bit more on shifting trade flows following the 1997 Asian Crisis. Enno Schroeder, whose decomposition of European trade flows I’ve mentioned here before, was kind enough to do a similar exercise for the four Asian crisis countries. 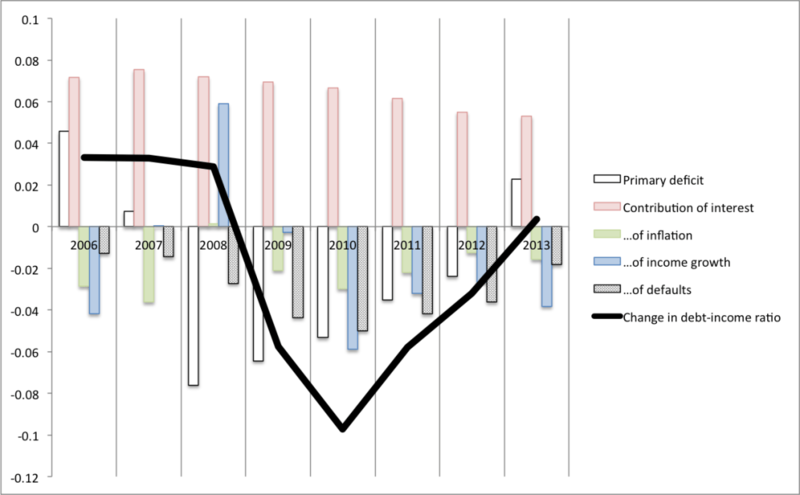 His results are here; below I present them in graphical form below. The conventional story, as we all know, is that relative prices drive trade flows. The Asian countries, in this view, moved from deficits to surpluses after 1997 because abandoning their currency pegs and devaluing made their exports cheaper and their imports more expensive. I’ve been suggesting a different story: Relative prices were relatively unimportant in the post-1997 move to surpluses, with the improved trade balance mostly or entirely a matter of lower imports resulting from the deep fall in income in the crisis. Looking at the picture in more detail suggests a more complex but in some ways even stronger version of my earlier story. The heavy black line is the actual trade balance. Again, since the balance here is expressed as the ratio of exports to imports, a value of 1 means balanced trade. The other three solid lines show the cumulative contributions of each component to the changes in trade flows after 1996; the values represent how the trade ratio would have changed from that factor alone. Yellow is expenditure switch, from the rest of the world’s goods to the home country’s; this includes both home country switch from imports to domestic goods, and foreign country shift toward the home country’s exports. Green is income growth in the country’s trade partners relative to the home country. The solid red line is the terms of trade. The dotted red line shows the cumulative change in the nominal exchange rate; this isn’t directly a contribution to the change in trade flows, but it’s useful to know how closely the change in the terms of trade tracks the exchange rate. It’s convenient to think of the difference between the black line and the green line as the change in competitiveness. The immediate effect of a devaluation is to make the home country’s goods cheaper in the rest of the world, and the rest of the world’s goods more expensive in the home country. The direct effect of this is to move the trade balance further toward deficit — a descending red line in the figures below. But in the conventional story, the change in price leads to a more than proportionate change in quantity — a rise in exports and/or a fall in imports — so that the overall trade balance improves. This should show up here as a rise in the yellow line steeper than the fall in the red one. Income growth doesn’t really come into the conventional story, so the green line should be flat. This is not what we see. Even in terms of this simple decomposition, the post-crisis experience of each of the four Asian NICs was different, but none of them fit the standard story. Devaluations don’t reliably translate into changes in the terms of trade, and changes in the terms of trade don’t reliably translate into changes in trade flows. The income-trade balance link, on the other hand, looks quite reliable. In terms of the debate taking place elsewhere in econ blog land, this is a case where “hydraulic Keynesianism” looks pretty good. Thailand is the clearest picture. In the 1997 devaluation, the baht lost about a third of its value; the fall in the terms of trade — the price of Thai exports relative to imports — was less than proportionate, but still substantial. You can see this in the red lines at the bottom. But there was no expenditure switch at all. 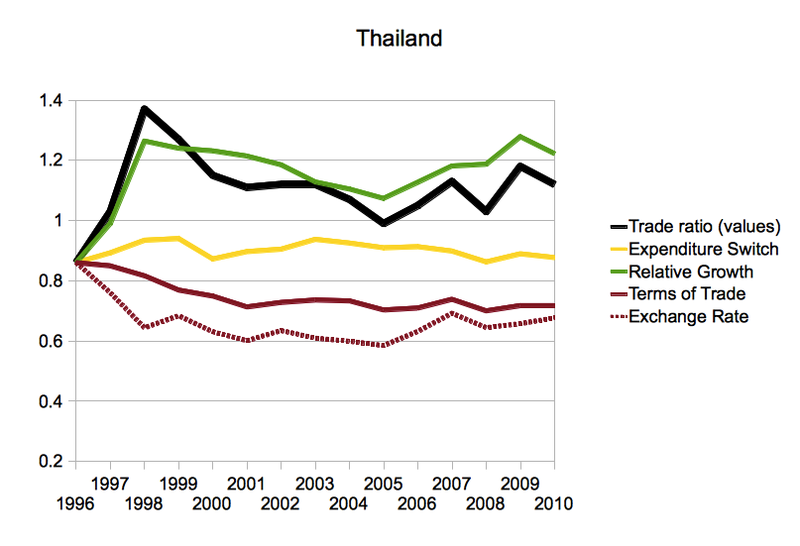 The flat yellow line shows that expenditure on foreign goods out of a given Thai income, and expenditure on Thai goods out of a given income elsewhere, did not change at all in the ten years after the crisis. (More precisely, expenditure in Thailand shifted toward domestic goods, while Thailand lost ground in its export markets; the two effects approximately canceled out.) Given that Thai goods were getting cheaper relative to foreign goods, the lack of net expenditure switch toward Thai goods should have led to deeper deficits. The only reason Thailand moved from deficit to surplus, is the decline in expenditure in Thailand relative to expenditure in its trading partners. The close match between the black and the green line in the figure, means that essentially the whole change in Thailand’s trade balance is explained by the change in relative growth rates; there was no net switch toward Thai goods from foreign goods. Here we see a very deep devaluation, but again only a moderate change in the terms of trade, and an even smaller response of trade volumes. As in Thailand, the trade balance basically tracks relative income growth. The difference between these two cases is where the devaluation-trade flows link fails. In Thailand, the devaluation did reduce the price of exports relative to imports, but demand was not price-elastic enough for the change in prices to improve the trade balance. (In other words, the Marshall-Lerner-Robinson condition appears not to have been satisfied.) In Indonesia, the even larger devaluation — the rupiah lost almost 80 percent of its value — failed to change relative prices of traded goods, so demand elasticities did not come into play. This is partly because of high inflation in Indonesia following the devaluation, but not entirely – the rupiah fell by nearly half in real terms. 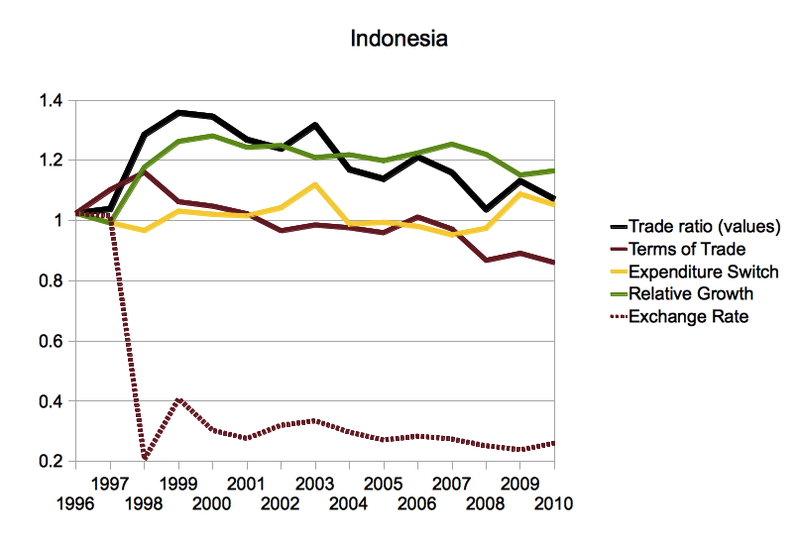 But there was no change in the price of Indonesia’s exports relative to its imports. If you want an example of a devaluation not working, this is a good one. Korea, by contrast, looks superficially like the devaluation success story. As I mentioned in the previous post, Korea was the only one of these countries where export growth in the decade after 1997 was as fast as in the decade before. 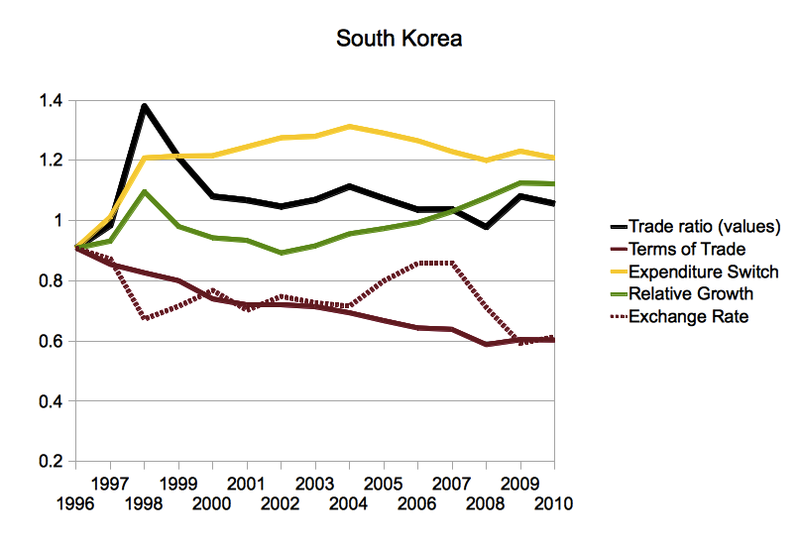 And as the figure here shows, there was a substantial shift expenditure toward Korean goods following the crisis; alone among the four countries, Korea achieved its immediate post-crisis improvement in trade balance mainly through favorable expenditure switch rather than solely through a fall in income (though that contributed too.) But over time, Korea’s terms of trade continued to deteriorate, without any further favorable expenditure switch; meanwhile, Korean growth slowed relative to its trade partners. By 2007, expenditure shares were back at 1997 levels; to the extent that Korea’s trade balance was more favorable, it was only because spending was lower relative to its trade partners. Of course the surpluses it had run in the meantime had allowed the accumulation of substantial foreign exchange reserves. But if the goal is to use a lower exchange rate to achieve a permanent shift in trade balances, Korea post-1997 cannot be considered a success. I should emphasize here: Slower relative expenditure growth in Korea does not mean slow growth in absolute terms. In fact, Korea (and, to varying degrees, the other three) did enjoy strong post-crisis recoveries. But because by far the largest trading partner for these countries is China — taking about 25% of their exports — even fairly strong growth translated into low relative growth. In other words, rapid growth in China implied growing exports in the NICs even in the absence of any competitiveness gains. Finally, the one country that did achieve a lasting improvement in competitiveness, Malaysia. In the immediate crisis period, Malaysia looks like Thailand and Indonesia: A deep devaluation fails to pass through to the relative prices of traded goods, and there is no expenditure switching; instead, the entire burden of raising the trade balance falls on slower growth in domestic expenditure. In the case of Malaysia, domestic expenditure fell by an astonishing 28 percent in 1997, a collapse in economic activity that has few precedents — neither the US in the 1930s nor any Euro-crisis country comes close. 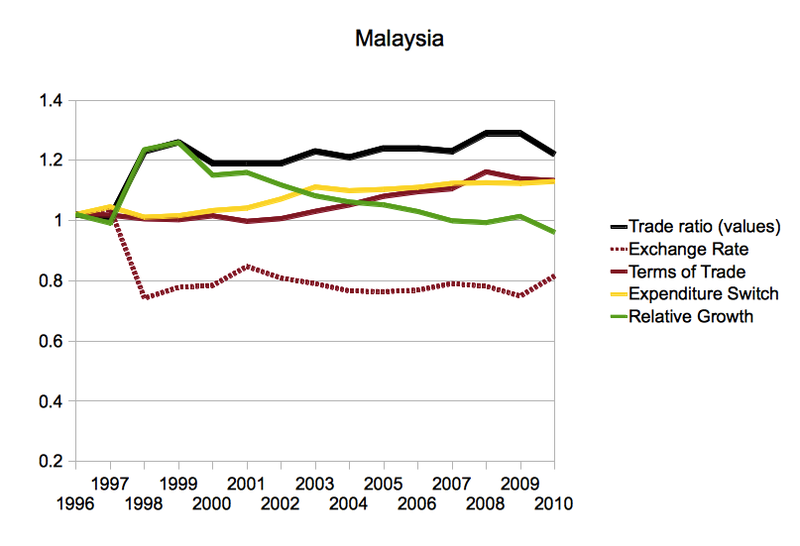 But in the case of Malaysia, unlike the other three countries, growth subsequently accelerated relative to its trade partners, reflected in the downward sloping green line; at the same time, there was a continued expenditure switch in favor of Malaysian goods, reflected in the upward slope of the yellow line. What’s especially striking about this competitiveness success story is that the favorable expenditure switch happened despite a rising price of of Malaysia’s exports relative to its imports. Even a very deep devaluation, as in Indonesia, is not guaranteed to change the relative prices of a country’s imports and exports. Even if a devaluation is passed through to relative prices, as in Thailand, price elasticities may not be large enough to produce a favorable change in the trade balance. Even if a devaluation moves relative prices, and demand is price-elastic enough for the price change to move the trade balance in the right direction, as in Korea, a short-term improvement in competitiveness may not persist. When countries do achieve a long-term improvement in competitiveness, like Malaysia, they don’t necessarily do so through a relative cheapening of exports compared to imports. On the contrary: If the Marshall-Lerner condition is not satisfied, then a relative increase in the price of a country’s exports will raise export earnings. In the case of Malaysia, improved terms of trade (that is, a rise in the price of its exports relative to its imports) account for about half the long-run improvement in its trade balance. The Asian precedent does not make a Greek (or Spanish, or Portuguese, or Irish) devaluation look like an obviously good idea. One other thing, if even real exchange rate changes are not passed through to traded-good prices in the destination country, then they must be showing up as changes in exporter profit margins. This shifts the focus from demand responses to supply responses, which I would argue are more institutionally mediated. As you can tell if you’ve read this far, I am sympathetic to the “elasticity-pessimist” strand of Post Keynesian thought. But on the other side Robert Blecker has a strong argument for a strong effect of exchange rate changes, focusing on the role of export-industry profits in financing investment. Blecker’s paper, in my opinion, is more convincing the straightforward “prices matter” view of exchange rate changes. But it also suggests a certain asymmetry: low profits induce exit from tradable sectors, especially for countries with Anglo-American market-based financial systems, more reliably than high profits encourage entry. UPDATE: The fact that even large exchange rate changes produce relatively small movements in the relative prices of traded goods is well-known in the empirical trade literature. See for example here. I should have made this clearer. I just participated (for the last time, thank god) in the UMass-New School economics graduate student conference, which left me feeling pretty good about the next generation of heterodox economists. A bunch of good stuff was presented, but for my money, the best and most important work was Enno Schröder’s: “Aggregate Demand (Not Competitiveness) Caused the German Trade Surplus and the U.S. Deficit.” Unfortunately, the paper is not yet online — I’ll link to it the moment it is — but here are his slides. where X and M are export and import volumes, m* is the fraction of foreign expenditure spent on the home country’s goods, m is the fraction of the home expenditure spent on foreign goods, and D* and D are total foreign and home expenditure. This is true by definition. But the advantage of thinking of trade flows this way, is that it allows us to separate the changes in trade attributable to expenditure switching (including, of course, the effect of relative price changes) and the changes attributable to different growth rates of expenditure. In other words, it lets us distinguish the changes in trade flows that are due to changes in how each dollar is spent in a given country, from changes in trade flows that are due to changes in the distribution of dollars across countries. The heart of the paper is an exercise in historical accounting, decomposing changes in trade ratios into m*/m and D*/D. We can think of these as counterfactual exercises: How would trade look if growth rates were all equal, and each county’s distribution of spending across countries evolved as it did historically; and how would trade look if each country had had a constant distribution of spending across countries, and growth rates were what they were historically? The second question is roughly equivalent to: How much of the change in trade flows could we predict if we knew expenditure growth rates for each country and nothing else? The point here is that if you only knew the growth of income in Germany and its trade partners, and nothing at all about German wages or productivity, you could fully explain the German trade surplus of the past decade. In fact, based on income growth alone you would predict an even larger surplus; the fraction of the world’s dollars falling on German goods actually fell. Or as Enno puts it: During the period of the German export boom, Germany became less, not more, competitive. 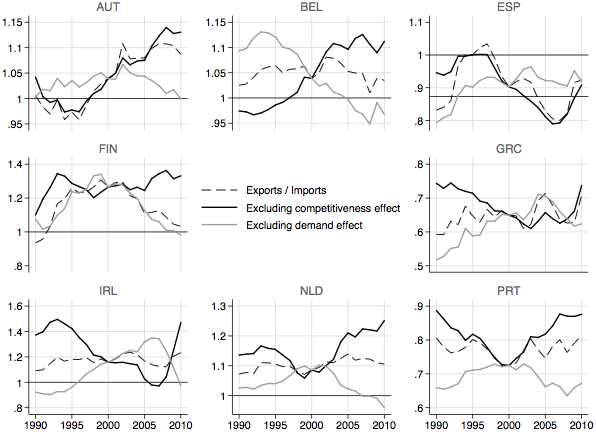 The cases of Spain, Portugal and Greece (tho not Italy) are symmetrical: Despite the supposed loss of price competitiveness they experienced under the euro, the share of expenditure falling on these countries’ goods and services actually rose during the periods when their trade balances worsened; their growing deficits were entirely a product of income growth more rapid than their trade partners’. These are tremendously important results. In my opinion, they are fatal to the claim (advanced by Krugman among others) that the root of the European crisis is the inability to adjust exchange rates, and that a devaluation in the periphery would be sufficient to restore balanced trade. (It is important to remember, in this context, that southern Europe was running trade deficits for many years before the establishment of the euro.) They also imply a strong criticism of free trade. 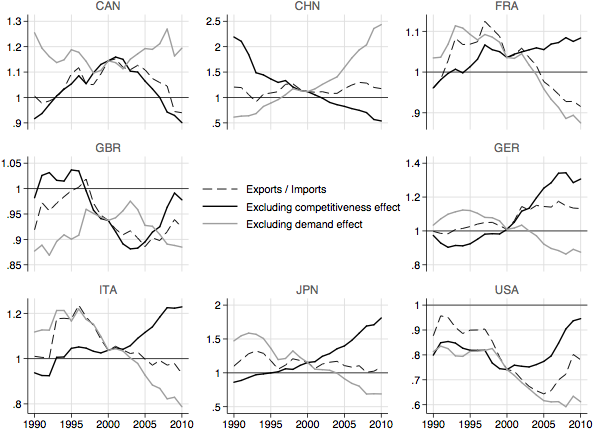 If trade flows depend mostly or entirely on relative income, and if large trade imbalances are unsustainable for most countries, then relative growth rates are going to be constrained by import shares, which means that most countries are going to grow below their potential. (This is similar to the old balance-of-payments constrained growth argument.) But the key point, as Enno stresses, is that both the “left” argument about low German wage growth and the “right” argument about high German productivity growth are irrelevant to the historical development of German export surpluses. Slower income growth in Germany than its trade partners explains the whole story. I really like the substantive argument of this paper. But I love the methodology. There is an econometrics section, which is interesting (among other things, he finds that the Marshall-Lerner condition is not satisfied for Germany, another blow to the relative-prices story of the euro crisis.) But the main conclusions of the paper don’t depend in any way on it. In fact, the thing can be seen as an example of an alternative methodology to econometrics for empirical economics, historical accounting or decomposition analysis. This is the same basic approach that Arjun Jayadev and I take in our paper on household debt, and which has long been used to analyze the historical evolution of public debt. Another interesting application of this kind of historical accounting: the decomposition of changes in the profit rate into the effects of the profit share, the utilization rate, and the technologically-determined capital-output ratio, an approach pioneered by Thomas Weisskopf, and developed by others, including Ed Wolff, Erdogan Bakir, and my teacher David Kotz. People often say that these accounting exercises can’t be used to establish claims about causality. And strictly speaking this is true, though they certainly can be used to reject certain causal stories. But that’s true of econometrics too. It’s worth taking a step back and remembering that no matter how fancy our econometrics, all we are ever doing with those techniques is describing the characteristics of a matrix. We have the observations we have, and all we can do is try to summarize the relationships between them in some useful way. When we make causal claims using econometrics, it’s by treating the matrix as if it were drawn from some stable underlying probability distribution function (pdf). One of the great things about these decomposition exercises — or about other empirical techniques, like principal component analysis — is that they limit themselves to describing the actual data. In many cases — lots of labor economics, for instance — the fiction of a stable underlying pdf is perfectly reasonable. But in other cases — including, I think, almost all interesting questions in macroeconomics — the conventional econometrics approach is a bit like asking, If a whale were the top of an island, what would the underlying geology look like? It’s certainly possible to come up with a answer to that question. But it is probably not the simplest way of describing the shape of the whale. A perennial question at these things is whether we should continue identifying ourselves as “heterodox,” or just say we’re doing economics. Personally, I’ll be happy to give up the distinct heterodox identity just as soon as economists are willing to give up their distinct identity and dissolve into the larger population of social scientists, or of guys with opinions. The results for the US are symmetrical with those for Germany: the growing US trade deficit since 1990 is fully explained by more rapid US income growth relative to its trade partners. But it’s worth noting that China is not: Knowing only China’s relative income growth, which has been of course very high, you would predict that China would be moving toward trade deficits, when in fact it has ben moving toward surplus. This is consistent with a story that explains China’s trade surpluses by an undervalued currency, tho it is consistent with other stories as well. Last week I promised a discussion of my new paper with Arjun Jayadev on “Fisher dynamics” and the evolution of household debt. That discussion is now here, not here, but at Rortybomb, where Mike Konczal has graciously invited me to post a summary of the paper. The summary of the summary is that the increase in household debt-to-income ratios over the past 30 years can be fully explained, in an accounting sense, y changes in growth, inflation, and interest rate. Except during the housing bubble period of 2000-2006, household spending relative to income has actually been lower in the post 1980 period than in preceding decades. If interest rates, inflation and growth had remained at their 1950-1980 average level, then the exact same household decisions about spending out of income would have left them with lower debt in 2010 than in 1980. And just as it wasn’t more borrowing that got us higher debt, less borrowing almost certainly won’t get us to lower debt. If household leverage is a problem, then the solution will have to be some mix of large-scale writedowns, higher inflation, and lower interest rates via financial repression. But I encourage you to read the whole summary over at Rortybomb or, if you’re really interested, the paper itself. Comments very welcome, there or here. UPDATE: Now also at New Deal 2.0. UPDATE 2: Responses by Kevin Drum, Karl Smith, Merijn Knibbe, Reihan Salam, and The New Arthurian. There’s some good discussion in comments at Mark Thoma’s place. And a very interesting long comment by Steve Randy Waldman in comments right here.